It is projected that by 2050, 83.7 million Americans will be over the age of 65, almost double the number who were that age in 2012. 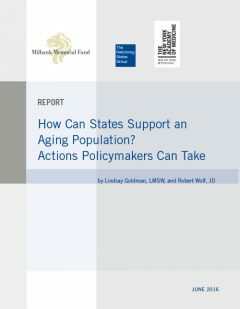 What can states do to support an aging population? During its fall 2015 meetings, the Milbank Memorial Fund’s Reforming States Group partnered with The New York Academy of Medicine to develop sessions focused on some of the major challenges and opportunities facing states as they work to support an aging population. At the meeting, state leaders had an opportunity to better understand the specific needs of an older population—and to uncover some of the promising solutions that states have already implemented to support this population. This report provides a review of the issues discussed at the meetings, as well as recommendations for state policy interventions. In addition to providing an overview about issues in aging, the report also focuses on topics of specific interest to state leaders: age-friendly communities; long-term services and supports; workforce shortages and palliative care; dementia; and innovations in technology.